Middlebury College’s U.S. Department of Energy Solar Decathlon 211 entry, Self-Reliance, had two roof-mounted solar hot water collector arrays (right) that circulated glycol through vacuum-insulated borosilicate glass tubes to transfer heat from the sun to the domestic water supply. The two main components of a solar water heating system are the solar collector and storage tank. Solar collectors are roof-mounted and angled toward the sun. Storage tanks are similar to conventional water heating tanks but larger and better insulated. It is even possible to modify a conventional tank to work with a solar hot water system. The most common type of collector used for residential water heating is a flat-plate solar collector. These consist of a thin, rectangular box with a transparent top and a dark-colored absorber plate base. As the solar collector warms up, water (or anti-freeze fluid in cold climates) moves through a network of tubes connected to the absorber plate. This heated fluid then travels to the storage tank. Evacuated-tube solar collectors are more often used for commercial applications but can be incorporated into residential systems as well. These collectors have rows of glass tubes that contain heat-absorbing metal tubes inside. Water or anti-freeze is heated as it passes through the tubes on its way to the storage tank. The cost of a solar water heating system depends on factors such as size, location, type, and incentives. The most basic solar water heating systems cost about $1,500 (USD). These passive systems rely on natural circulation to move fluid between the collector and storage tank. Active systems, which use a pump to circulate fluid, cost approximately $3,000 (USD). With this investment, homeowners can expect to save 50%–80% on their water heating bills. Additional information about solar water heating is available at the Energy Savers website. 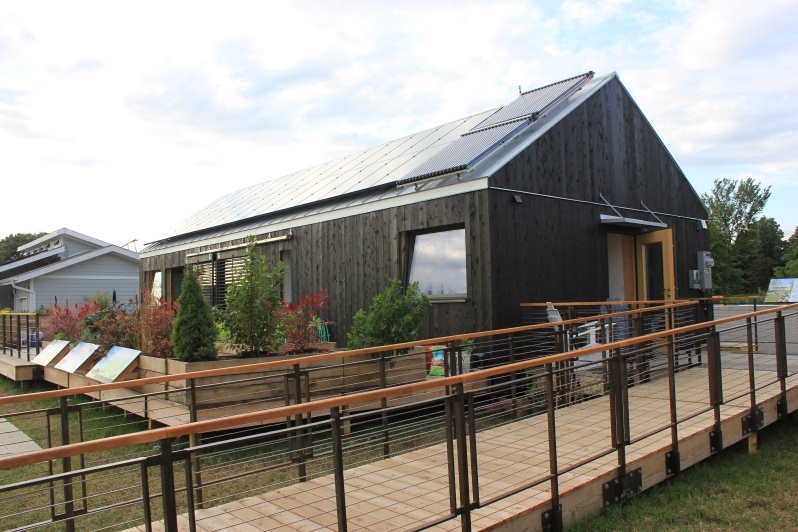 To learn more about the solar hot water systems used by past U.S. Department of Energy Solar Decathlon teams, search the 2009 product directory and 2011 technical resources. Alexis Powers is a member of the Solar Decathlon communications team. This entry was posted on Friday, September 27th, 2013 at 8:49 pm and is filed under Solar Decathlon, Solar Decathlon 2013, Technology Spotlights.